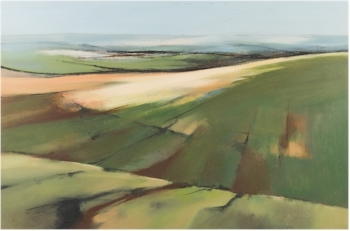 Michael J Praed (b 1941): Sweeping Moors (FS35/557). Estimate £150-£200. Michael Praed was born in Cornwall in 1941 and studied at the Penzance and Falmouth Schools of Art. He went on to teach art in Penzance for nearly thirty years before working full-time on his own paintings. Praed lives in the fishing port of Newlyn and his studio has views over the harbour and across the bay to St Michael's Mount. 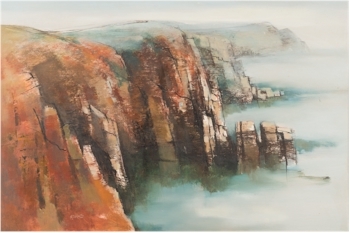 His paintings of the Cornish coastline, sea and cliffs have a distinctive personal style. 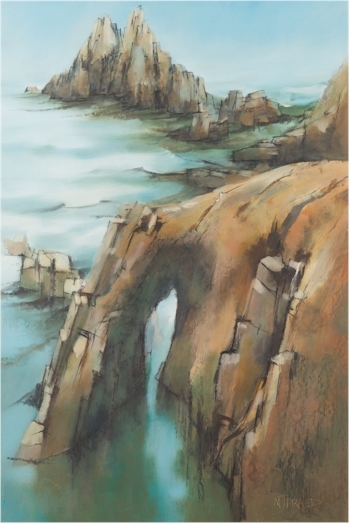 The strong, near vertical lines and rust coloured formations that often pervade the coastal views evoke the granite cliffs and harbours of West Cornwall. Michael J Praed (b 1941): The Penwith Cliffs (FS35/555). Estimate £150-£200. Praed's paintings have been exhibited widely in the UK and abroad for over forty years. He has held solo shows in London and across Europe and is a member of the Penwith Society of Artists and a former Chairman of the Newlyn Society of Artists. The Picture Auction within the July 2017 Fine Sale on 11th July 2017 has four original painting by Praed, each with an estimate of £150-£250. 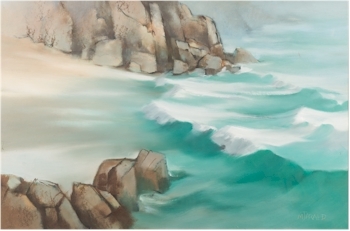 Michael J Praed (b 1941): Porthcurnow, 1988 (FS35/554). Estimate £150-£200. Michael J Praed (b 1941): The Armed Knight and Enys Dodnan off Land's End(FS35/556). Estimate £150-£200.